Even with all of the fast-paced craziness of the holidays, there are still a few opportunities to slow down and enjoy some of the more simple joys of the Christmas season. 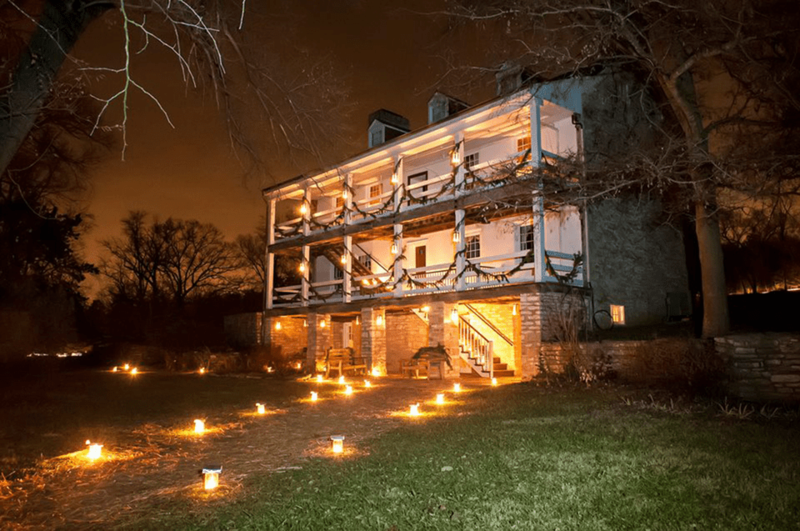 One such event is the annual Christmas Candlelight Tours at the historic Daniel Boone Home at Lindenwood Park in Defiance, Missouri. The Christmas Candlelight Tours are held each year in early December. In 2018, the tours are Dec. 7 and 8, and 14 and 15 from 6:00 to 10:30 p.m. You'll experience Christmas as it was in the early 1800s with stories, music, and hot cider. The cost of admission is: Pre-Registered Admission: $10; Children 4 and under free. At-the-Door Admission is $15 but reservations are recommended. The Daniel Boone Home, 1868 Highway F in Defiance, is in St. Charles County, about 45 minutes from downtown St. Louis. To get there, take Interstate 64/U.S. Highway 40 west across the Missouri River to Weldon Spring. At Weldon Spring, exit onto Missouri Highway 94 west and travel another eight miles. Turn right onto St. Charles County Highway F and go five miles. The Daniel Boone Home is on the left side of the road. Hundreds of candles light the way, creating a warm glow as you make your way through the historic house and heritage center. Take in the period costumes and decorations and see how residents on the Missouri frontier got ready for Christmas. After your tour, you can relax with hot cider and cookies by the fire. The Daniel Boone Home is open to visitors year-round. This historic home was built in the early 1800s and was actually the home of frontiersman Daniel Boone's youngest son, Nathan. The limestone house is impressive for a house on the frontier; it is four stories tall and took several years to build. This all-stone construction was meant to be protection from Native Americans in the area at that time. Daniel Boone moved his entire family from Kentucky to the Upper Louisiana Territory, what is now Missouri, in 1799 and settled on 850 acres. Daniel Boone was a commandant of the region and a judge until he died at the home in 1820 at the age of 86. Today, the house and a simulated village of the period with buildings that were originally within 50 miles of the house are open to visitors. They provide a look at what life was like in Missouri in the early 19th century. In addition to the Christmas Candlelight Tours, the Daniel Boone Home hosts other special events during the year. Some of the most popular are Trivia Night in September, and Spirits of the Past in October. For more information and a complete calendar of events, check the website. The Defiance Christmas Festival in downtown Defiance features a 5K run/walk, parade, market, Santa photos, food, kids activities, and an evening wine & cheese event. The Defiance Ridge Winery, which is part of the festival, is the place to watch the start of the parade on December 1st, 2018. Throughout the holidays they will be open for wine tasting.